February 28th in Wordpress Plugins by Wordpress Jedi . Many of us are active on multiple social networking websites, such as Twitter, Facebook, Google+, LinkedIn, Pinterest, YouTube, and Instagram. 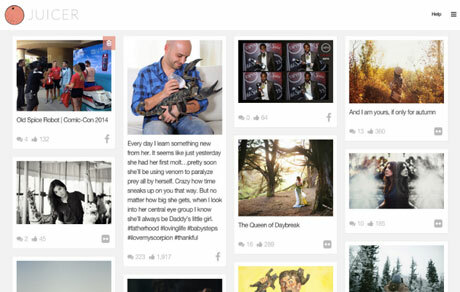 With Juicer, you can turn your social media updates into an attractive feed on your website. This plugin lets you set up rules and filters to display only the updates you want. Juicer supports Facebook, Instagram, YouTube, Tumblr, DeviantArt, and many other popular websites. It has a responsive grid with infinite scrolling. Users can remove their content fast. Want to organize your content by username or hashtag? No problem. To get started, you will just have to sign up on Juicer’s website and add a shortcode with your feed name. Users can customize their feed with custom CSS users. This is a free plugin.